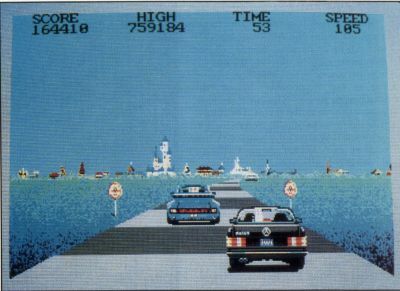 Way back when I saw my first home video-game system (yes, it was an Atari), one of the cartridges I saw demonstrated was a racing game called Night Driver. 1 won't say that Night Driver was the first game of its type, but I will say that since that time dozens of similar driving "simulators" have been released. They all look and play the same: the car remains "stationary" on the screen, while the road whips toward you, giving the illusion of high speed. As you manuever around corners, the background scenery shifts left or right, further enhancing the illusion of movement. This type of game probably hit its peak of popularity with both the arcade and home versions of Pole Position, and the new versions have offered little new. Crazy Cars is yet another in this long chain of racing games and, I'm sorry to say, can't even keep up with its older competition. You race your car (using the joystick or the arrow keys; either control method "feels" about the same) on a two-lane-wide road, accelerating, braking and steering your way past the other racers. If you manage to win the three stages of the race, you'll be awarded a snazzier car for your next competition. You start with a Mercedes 560. As you progress, you'll get to drive a Porsche 911, a Lamborghini Countach and a Ferrari GTO. Unfortunately, Crazy Cars has an unfinished feel, as if the programmers got to the point where the game was just playable and then called it quits. For instance, unlike Pole Position, when your car crashes there is no explosion effect; you just slow down and lose some time. In fact, as far as animation goes, about the only "extra" is the way the car bounces when it goes over a bump at high speed. The graphics are adequate, though not exceptional, and the sound effects are about what you would expect: a lot of squealing tires and shifting gears. I don't know. Maybe I've just gotten tired of seeing the same old racing scheme over and over again. You'd think that, after all these years, someone would have come up with something new. "In Crazy Cars, you race your car on a two-lane-wide road, accelerating, braking and steering your way past the other racers."